Direct Oceanfront Just steps away from beach - Its all about the Views! 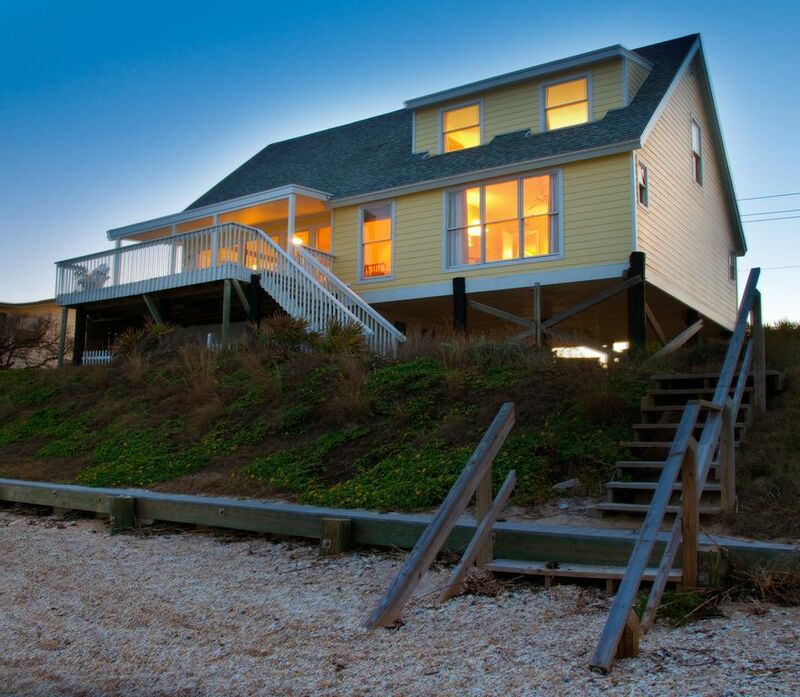 Oceanfront House, 4 Bedrooms, 3 bath, Sleeps 8-10, - Brand New Kitchen! Welcome to Casa del Sol of Ponte Vedra Beach with spectacular ocean views from many rooms in the house . This Beautiful Oceanfront Home is just steps away from the beach ! Our beach is private with no commercial traffic or public access close by,,, enjoy the salt life with no crowds...Less than 15 minutes from down town St Augustine ! Awesome Addition as of Jan 2019 -Brand new completely remodeled kitchen for your enjoyment ! White cabinets with quartz countertop and all new appliances enhance your vacation experience at Casa del Sol . We have made the best even better - Our recent tenants have expressed such positive feedback on our new beach chic decor , in addition to our new kitchen, we have repainted with lots of Seaglass Colors , added new flooring and , also 2 new king mattresses in 2018. We take pride in our home and continue to maintain and improve our home for our guests vacation enjoyment . Casa del Sol is located directly on the beach, unobstructed oceanfront views from the deck and interior of home . You walk down one set of stairs from our deck and you are on the beach ! Super convenient + added bonus room below with ping pong table . CASA DEL SOL is a four bedroom/ 3 bath vacation rental in desirable South Ponte Vedra Beach within 15 minutes of Downtown Historic St Augustine. CASA DEL SOL is a spacious 3000 sq ft home . The house has 3 levels - main level has most of the living space. Lower level third bath as its own separate access . Free Wifi during your stay. Beach chairs, beach toys are available for our guests usage. Wrap around outdoor decking with teak and wood furnishings -large outdoor Table, benches , multi lounges chaises and chairs for comfort. Outdoor charcoal grill - new grill August 2018. Part of deck has covered lanai . Large cooler on deck for beverages! The interior offers a Spacious open family room with cathedral ceiling, wooden beams throughout and spectacular ocean views. Two sofas , plus a love seat and multi chairs to relax...Large Flat Panel TV with cable access and dvd. Awesome sounding blue tooth speakers. Family room opens to a spacious kitchen with plenty of room to prepare a feast. We get rave reviews on Our large dining table which comfortably seats 10 people. Kitchen is fully equipped. Lots of cabinets; dishwasher, microwave, oven and Refrigerator, beverage cooler. . There is also a second Refrig in the garage. Bedroom 2 has ocean views and king bed, bedroom 3 has queen bed, bedroom 4 has 2 twin beds (trundle), three of the four bedrooms have ocean views. On the lower beach level we have a rec room with ping pong table and the 3rd beach bathroom with separate access from main house, very convenient for your beach usage. Our beach is sandy white with hints of coquina shells, peaceful and private. We are not located near a public beach and no cars have access to drive on our beach. Our beach is great for swimming , no rough waves or rocks. In addition to our many amenities we offer our guest Free use of HIGH SPEED WIRELESS INTERNET access and FREE local and domestic long distance phone calls. Our home is well maintained and has tasteful beach decor touches. We take pride in managing our home. We have many repeat tenants who enjoy our home year after year. Parking in available in our driveway which fits up to 4 vehicles... there is also parking available on the west side of the street as long as you don't block the bike lane. We have board games, Large JENGA blocks, puzzles, books, corn hole, there are several Tommy Bahama beach chairs and beach toys in our garage - all included for your usage during your stay. r guests during their stay! We love Casa del Sol and it is truly 'the House of the Sun': The house is direct Oceanfront, beach is within steps of home, visitors comment on how much they enjoy our home and feel so comfortable and welcomed. Guests can watch the dolphins swim by and the pelicans fly above from our deck. We take pride in our home and have many repeat renters. The location is perfect, mostly residential non commercial, private beach yet Downtown St Augustine is less than a 15 minute drive. You dont have to worry about crowds or cars driven on beach. Guests love to swim in ocean or enjoy the beach club usage just 5 minutes away. You can also fish from shore. Marina is close by. The Guana State Park is directly across the street. The inter coastal waterway is just to the west- deep sea fishing excursions offered at local marina. The Views!! Watching the sunrise is amazing or the moon rising. Our Deck is so relaxing. Playing in sand walking on beach enjoying,waking to the peaceful sounds of the waves. The Guana State Park entrance just one mile north - great hiking trails, fishing , canoeing ! Our beach front is sandy with hints of coquina shells, there is no public access close by and no cars are allowed to drive on our beach. We do not have any rocks and swimming is great! Myself and 7 friends and family stayed at Casa del Sol from April 5 through April 12, 2019. It was the perfect place to stay. Some people were on the beach while others were on the deck. Plenty of room for everyone and then some. Part of the deck is covered for those who are sensitive to the sun. The décor in the house was very welcoming. It felt like home. I would love to go back next year. A really nice spot. We had our two kids and their families including 2 grand kids. There was something for everybody - ping pong and the views for the older crowd, and lots of beach toys for the little ones. We all had a lovely, relaxing time. Location on the beach can't be beat. House is perfect for our girls weekend. Fourth time staying here. The layout and views are great. The new kitchen was awesome. The downstairs shower could use some attention. Overall pretty perfect for our needs. We will be back! We were four couples who stayed at your beach house for four days at the end of December 2018. We thoroughly enjoyed our stay. We loved the open concept and loved having our dinners at the large table. The weather was fine, and we were able to take several walks on the beach. It was awesome to see the sunrise and sunset. The restaurants in the area where quite good . It was such a great place for a girls weekend! We loved sitting out on the deck with coffee in the morning and wine in the evening. We didn’t feel the need to go out much because we had everything right there. We will for sure stay here again! Great home in a perfect location. Had beach gear delivered straight to the house. Outdoor shower was super convenient. Nothing bad to say, this was a wonderful treat! Thank you! Thanks Andrew for your positive review. We are glad you enjoyed your visit at Casa del Sol of Ponte Vedra !